LBAHQ is proud to release our Language Changer utility. This utility allows you to change the spoken and the text-dialogue languages on the fly using a simple menu. Our language changer utility supports all versions of LBA & LBA2, but it has been geared towards LBAHQ's custom versions of LBA and LBA2. With this program, there's no need to manually edit the config file yourself. It's quick, easy, and does what it's supposed to do all the few clicks of a button. Fixes: Encoding works properly now from the newly saved lba or lba2.cfg file. Language changer actually works now. 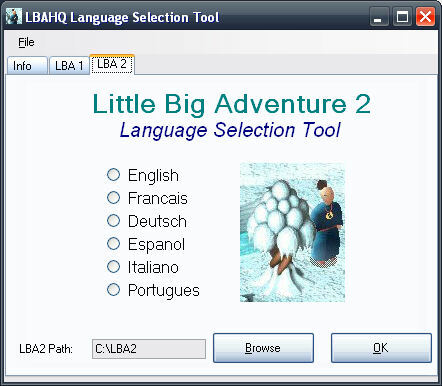 LBAHQ's Language Changer requires at a minimum Microsoft .NET Framework version 2.0. Please download and install the .NET Framework if you don't have it installed already.Without it, the program will not work!